This blog post is by MSU graduate student Mike Wiser. Many things in life seem to follow the Goldilocks principle: both too much and too little of something can be worse than striking a balance somewhere in between. Goldilocks saw this in heat of porridge, size of chairs, and softness of beds. In a recent paper, we show that this applies to mutations in an adapting population: there are times when the mutation rate is too high, and others where it’s too low. Mutations are tricky things to think about. At the core, they are merely differences between a new copy and its template. In biological systems, the majority of mutations are deleterious – that is, they harm the mutant. Many of the remaining mutations are neutral, and have no net effect. Only a small percentage of mutations are beneficial, in that they make the organism better at something. This is because cells (and their protein components) are complicated things that generally already work; changing things at random in a complex machine is more likely to break it than improve it. But if mutations stop occurring, no new variants come into a population, and without variation, adaptation by natural selection grinds to a halt. I work with the Long Term Evolution Experiment, an ongoing experiment in the lab of BEACON researcher Dr. Richard Lenski. The LTEE consists of a set of 12 populations of the bacteria E. coli, each diluted by a factor of 100 into fresh growth media daily. Frozen samples are collected every 75 transfers, roughly every 500 generations, and stored for future analysis. Because bacteria can be stored indefinitely at very low temperatures, and then revived later, it is as if we have a frozen fossil record of each of these 12 populations, going all the way back to the beginning of the experiment. My work with the LTEE focuses on how fitness – essentially, a measure of the bacteria’s ability to turn resources into more bacteria – changes over time. At broad scales, fitness over time follows a very smooth progression. 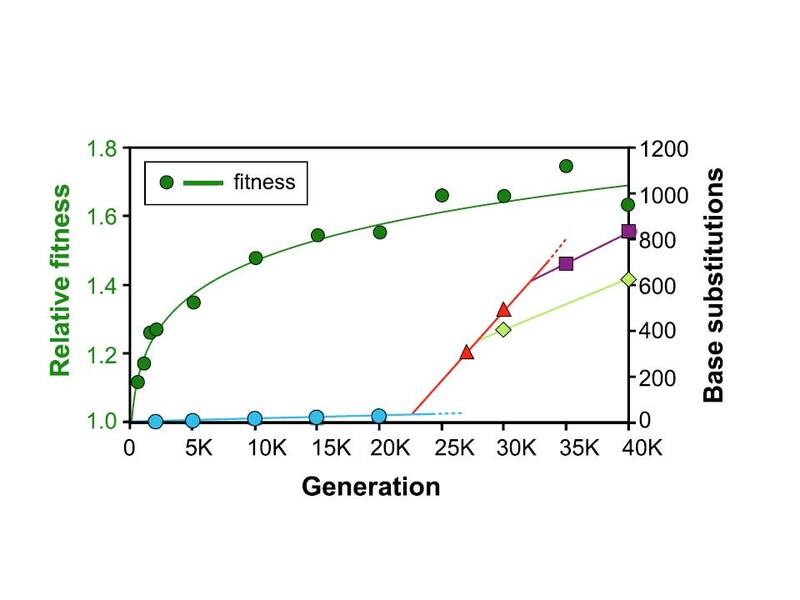 For the population that is the focus of this paper, that fitness over time is the green line, tracing the dark green circles high on the graph below. However, the mutation rate in this project follows a very different pattern – a very slow rise at first (the blue line and circles), then a very rapid rise (the red line and triangles), and then two separate reductions (the light green diamonds, and the purple squares). Beginning very early in the LTEE, some of the populations began mutating much more often than the ancestor, generally a 10- to 100-fold increase. It happened in this focal population sometime between 20,000 and 24,000 generations into the experiment. This switch to being a hypermutator can happen when any of the genes involved in finding or fixing errors itself becomes less effective due to a mutation. Even though most individual mutations are harmful, about half of the populations have these increased mutation rates, showing that there is some benefit to an increased mutation rate, at least for a short time in this environment. This benefit is suspected to be because the hypermutator, producing so many more mutants, is more likely to also get a rare beneficial mutation, where the combination of all the mutations it has is still beneficial compared to a bacteria with none of these mutations. In a sense, the beneficial mutation is what’s increasing in frequency, while every other mutation on the same genome – including the mutation that raised the mutation rate in the first place – hitchhikes along with it. Once a mutation rate increases, though, it’s much harder to lower it again later; there are more ways to mess up the repair process than fix a broken one. Our research team took advantage of this frozen fossil record for one of these populations, sequencing 22 total clones from a variety of time points. Reconstructing the relationships between these clones, we were able to determine that the hypermutators became established in the population between 20,000 and 24,000 generations. Interestingly, though, the increased mutation rate didn’t stay uniformly as high as it started out. Our analysis shows that two different subpopulations subsequently arose between 25,000 and 33,000 generations with different mutations which lowered the mutation rate in the hypermutator, though not all the way back to the ancestral rate. 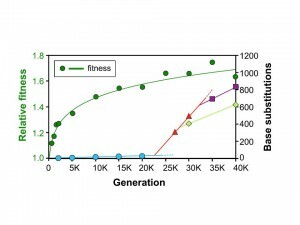 These subpopulations persisted to at least 40,000 generations, and the benefit of this lowered mutation rate is calculated to be right in line with the typical beneficial mutations seen in this general timeframe. Like an increasingly large amount of science these days, this project spanned a large team of researchers in multiple locations. This paper involved a collaboration between two BEACON institutions, including the Lenski lab at MSU and Jeff Barrick’s lab at UT Austin, along with Prof. Dominique Schneider (Rich’s long-time collaborator) in Grenoble and a sequencing team at the Genoscope lab in Paris. The NSF supports not only the BEACON Center but also Lenski’s long-term evolution experiment through the Long Term Research in Environmental Biology. S. Wielgoss, J. E. Barrick, O. Tenaillon, M. J. Wiser, W. J. Dittmar, S. Cruveiller, B. Chane-Woon-Ming, C. Médigue, R. E. Lenski & D. Schneider 2013. Mutation rate dynamics in a bacterial population reflect tension between adaptation and genetic load. Proceedings of the National Academy of Sciences 110: 222-227. This entry was posted in BEACON Researchers at Work and tagged BEACON Researchers at Work, Biological Evolution, experimental evolution, fitness, long term evolution experiment. Bookmark the permalink.